Seeking high quality music instruction? It’s never too early … and it’s never too late! Stop by our Sorrento Valley location on Sunday, March 17th from 1:00-4:00pm to “try on” our music community! At the Open House you can try-out our group classes, meet the admin team (who can help you register on the spot for the spring quarter), and take some fun pictures at our Saint Patrick’s Day photo booth! Music Adventures (4-6 yrs) is an exploratory class that exposes young learners to different instruments and music fundamentals. Activities often include: learning the notes on the staff, learning to clap rhythms, playing the recorder, and singing. String FUN (4-5 yrs) & String Play (6-8 yrs) are beginning violin group classes that introduce students to the basics of playing the violin and reading music in a comfortable environment. These classes focus on both ensemble and solo playing in order to boost social playing skills and confidence. 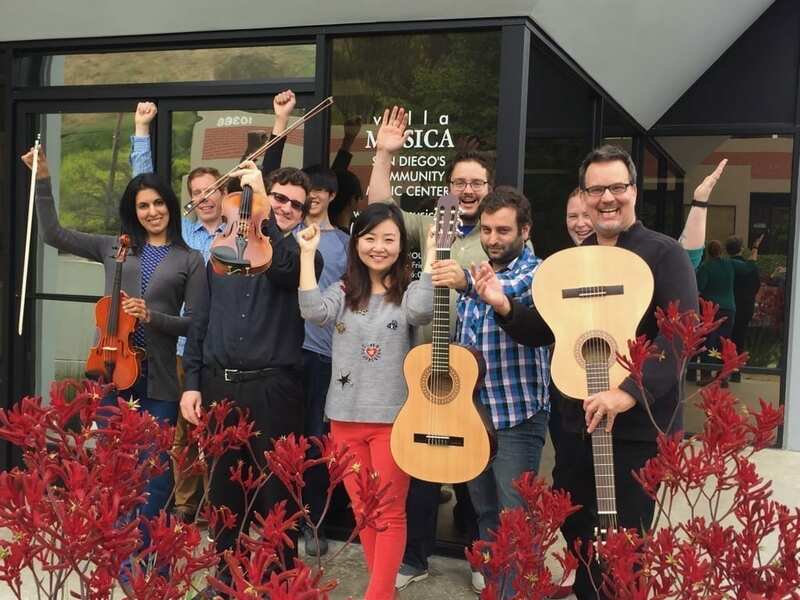 Group Guitar (7-12 yrs) provides students with a strong foundation in classical guitar. The first level of this class introduces the basics of good technique, chord structure, music reading, and effective practice methods. Our Singing Group Classes include something for everybody! La-Ti-Do (5-8yrs) & Glee Jr. (8-11yrs) teach students proper singing and breathing technique while students also learn to sing and dance to favorite pop and movie songs. Scene Squad (12-17) builds upon these skills, and also works on building stage presence. For adults who wish to learn the basics of singing, we offer Singing I! We’re excited to see you there! If you have any questions, please send your inquiries to Maddy at admin@villamusica.org.